Imagine how big the population of illegals in America would have been if President Trump not put his foot down. You can bet the Democrats never planned on him doing so. They figured he would fold like a typical Republican. But he did the politically unthinkable for a Republican and held his ground. And not just in a little way. Trump drew a red line, then dared the invaders to cross it. In preparation to protect America from criminals, President Trump toughened the border. More border patrol agents, and of course, use of the military. And when the soldiers laid down that razor wire, it wasn’t just Democrats who got the message. 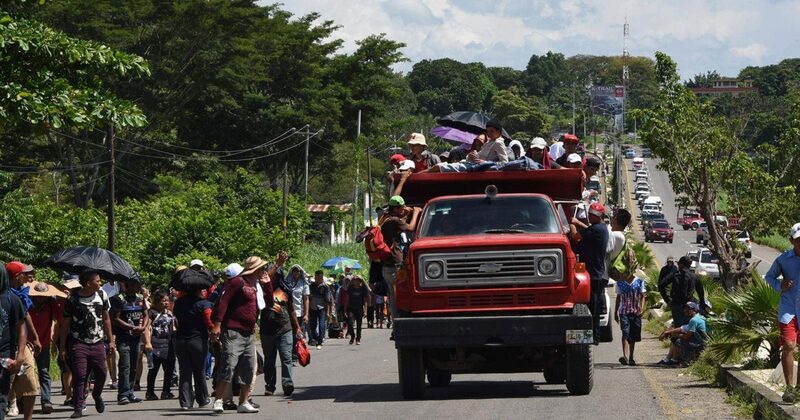 We reported thousands in the “caravan” decided that getting into America wouldn’t be as easy as they were told. So they turned around. Then Mexico came on board. Surprisingly and certainly under-reported, Mexican leadership sided with President Trump. I’m sure Democrats lost their minds over this. The Mayor of Tijuana wore his red “Make Tijuana Great Again” hat, as an obvious sign of solidarity with President Trump. Many Tijuanans echoed the sentiments of American citizens, demanding the invaders leave. As usual these, things didn’t go as planned for the Democrats. The handful of illegals making it into the U.S. are being apprehended fast. The numbers getting past our added security is embarrassingly low for Democrats’ voter registration drives. In short, because of President Trump, the majority of these invaders remain on the Mexican side of the border. Under Trump’s leadership, a significant increase occurred in the number of illegals apprehended. In fact, Rio Grand Valley Sector agents netted 63,278 family units just last year. Sure, there are plenty of immigrants who are just seeking a better life. They want to work and pay their taxes and be good citizens. But sadly, too many of them are criminals who want to wreak havoc in our society. And its incomprehensible that the left doesn’t want to take the time to sort the good from the bad. Unfortunately, we end up with countless stories of criminal behavior. Take, for instance, this murderer who embedded with the invaders. Miguel Angel Ramirez was an inmate in Honduras until earlier this year. And he wasn’t incarcerated for jay walking. After his arrest near Tijuana for illegal entry, Ramirez’s murder conviction popped up. Of course, a record like that makes a person ineligible to legally enter the US. Yet, the leftist media hides the stories like this. They want us to all feel sorry for the migrants and welcome them with open arms. Why? So they can join the Democrats at the polls, with or without citizenship. Therefore, liberals paint stories of a caravan made up of sweet women and adorable children. However, the left’s rhetoric is a work of fiction. Judge these invaders by their terrible behavior coupled with their insistence on entering illegally. Then the picture is much clearer. There’s an old saying. “When someone shows you who they are, you better believe them.” The immigrants showed their true colors long ago. But leftists refuse to believe them. Lucky for us, Trump is in charge.